Having skied many resorts in France we consider the Portes du Soleil ski area to be the best! There is always somewhere to ski, even if conditions are poor, as the area is vast and well-groomed. We stay in St Jean D'Aulps just out of Morzine as it is quieter and more relaxed but has very good amenities and a beautiful local ski area. Alpine-Adventure provides a service second to none! Wonderful hosts and accommodation. Will be returning as soon as possible! Aways use BASS not ESF when in Morzine. Very good instructors and lessons for kids! To all those who know Morzine well, or perhaps don't! Visit the newly refurbished 'Le Chaudanne'. 5 mins walk down Route de la Plagne from tourist office. Tasteful new wine bar in stone and wood basement and great new restauarant. Food thankfully not changed. Still superb as ever. Just as an add on to the comment on buying an area pass daily, wouldn't personally recommend myself. If you're good skiers and go to Avoriaz, you will want to cross several areas in one day. We often do Avoriaz first thing then shoot over into Switzerland and do all the villages right over to Morgins and back, when conditions good. Just spent a week in Morzine in the Viking. The conditions were not ideal, but that's the chance you take I suppose going so late in the season. Despite the lack of snow, the runs were well prepared and the local population, be it lift attendants, shop keepers, hotel staff were very friendly and helpful. My only complaint would be the level of "instruction" afforded by ESF. Booked the kids in to ski school, which, due to the numbers and lack of instructors was more like a creche! The instructor the kids had was very unhelpful and in fact downright rude, refusing to even acknowledge the kids when they tried to say thank you (in French!) I take on board all the comments as to speaking the local language and as a group we all have reasonable French, with the exception of the kids. Language barriers aside, a smile is universal! Despite the "instruction", I would recommend Morzine and the surrounding area as a great place to visit at any time of the year. The best house is in Le Biot, chez Lory! 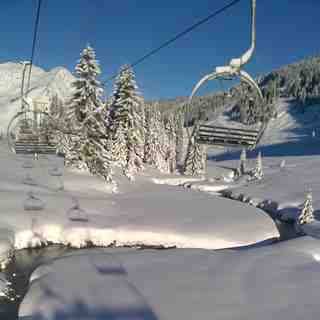 Easy access each day to Avoriaz, Morzine, Le Gets, Neon, Chatel, or a number of resorts all within 15 mins drive. With the largest number of ski runs in the world, Portes de Soleil is the best for skiing!! Tip - buy your pass on a daily basis...some resorts are much cheaper than others! Works out much cheaper than a full pass for the whole area! Take a picnic for your lunches...lots of great spots to stop and watch the world go by...do some "extreme deck-chairing"! Off there in 2 days time...yippeeeeeee! But i thought they understood you if you shouted? just joking - before i get the self righteous lot on the attack. Morzine is a great Town and beautiful to ski in, think people should always have due respect when they are guests in others countries. Have a go at a bit of french while you are there- otherwise how much time did you waste in school? Vast majority of french people react positively when you make the effort. 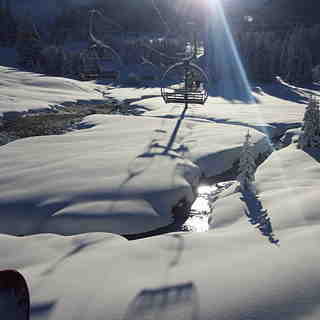 Everyone should ski Morzine and its surrounding areas - its so vast. We stayed down the road in St Jean d'Aulps... hospitality - second to none, great family, bundle of laughs. These guys really know how to make a holiday! Twice daily runs to and from the slopes to anywhere you want! Jo and Tony - THE reason for us making sure our next ski holiday is Morzine - staying at Chalet JoJo!